Let’s talk! Enough of this TL:DR culture. Enough of shallowness and gimmicks. Let’s talk shop. Let’s talk craft. Let’s be honest. And that’s the truth, Ruth. The above quote comes from L. Nichols (emphasis mine), one of the talented and super-friendly comics folk I met at SPX the other weekend. L has been posting examples of some of the influences on her work, notably ones that fall outside of what we normally might consider comics. I recommend checking them out, I’m sure you will learn something (she was inspired to start this practice because of similar posts over at Darryl Ayo’s and the ever useful livejournal de Brandon Graham). Back to the start, I agree one hundred percent with her calls for more discourse in comics, more serious talking, and so I’ve been inspired to take my own whack at it. I’ve typically thought and talked about works that have influenced me in the past, but I think I’ll use this space to talk about stuff that I look to at present for guidance and inspiration. I’ve got a couple groupings in mind that we’ll take one at a time. Following in L’s step, I’ll try to include a majority of non-comics material, but I still want to bring it back to comics because, frankly, there is so much great stuff that I can only even start to pick at the surface. So, without further yappin’, the first installment of this series will take us eastward. I know Katamari Damacy is an amazing game, it’s a hell of a lot of fun, there’s a whole lot to admire about it. However, when I first caught sight of Keita Takahashi’s most recent game, something in my brain attained a perfect equilibrium. The innocent silliness and just absurd movement and downright basic concept, I always find myself at a loss for words when talking about this game. It just feels so right, like a perfect formula brought about by a keen mind that understands fun and joy. 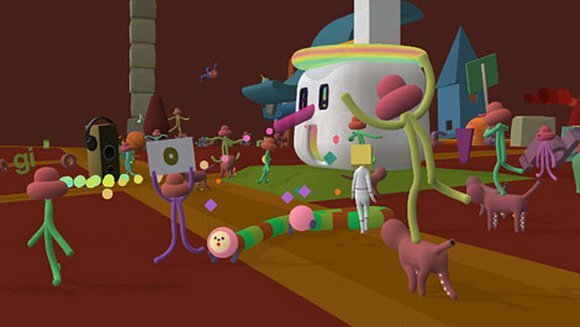 Noby Noby Boy seems to take Katamari’s spirit and distill it down, trimming away all the excess down to this stunning minimalist package. Now, full disclosure here, I have not played this game. That does not keep me from appreciating the concept, the art or the design. What really tips the basket over is the role of Girl — through the cumulative efforts of players connecting through the Playstation Network, Girl stretches throughout the solar system, unlocking new planets to play on. She’s up there right now! Stretching! Amazing. Part of my appreciation also comes from how this game defines its own identity. Takahashi thinks like an artist, when approaching a design, he asks “how can I create something to play with” rather than “what will my next game be?” The distinction lies in form and function — he’s making decisions that are true to the art, rather than being prescribed by an industry. It’s no surprise then that the end result is so unique. Along with Fumito Ueda’s Ico, Noby Noby Boy is one of the few video games that sets a serious precedent for recognizing that games are art (side note: art in this case is not a value judgement — all video games are art. However, I would make the value judgement that Noby Noby Boy is serious and good art, which I would not attribute to most video games). If I ever get a Playstation 3, it will mostly be to play this game. It’s not just the concept that I find so engaging about Noby Noby Boy, frankly it’s also the art. I’m a sucker for the silly cutesy minimally graphic aesthetic that this game shares with Katamara Damacy, Parappa the Rapper and the work of Yoshitomo Nara (his best work in my opinion are little scraps and sketches that are featured in the book Nobody Knows). This visual style matches perfectly with the almost sublime feelings that defy reasoning — if you try to hard to apply physics to it you risk evaporating the charm. I’ve resisted making the comparison, but really, there’s a zen quality to it all. Now that we’ve addressed the visuals, it brings us to Taiyo Matsumoto’s No. 5, one of the many products of Japanese culture that unfortunately was not a big enough sell to make its way over stateside in its entirety. To VIZ’s credit, they certainly tried, translating 2 of the 8 volumes into English, though now out of print as far as I know. Matsumoto is probably best known for Tekkonkinkreet and GoGo Monster. Both great, I’m particularly fond of No. 5, distinctly remembering my mind cracking open when I first started reading it, having had no prior conceptions of what I was getting into. My first thoughts — “this is the Katamari Damacy of comics… (said with all the awe you can muster). The art is greatly inspired by Moebius and other clean-line Franco-Belgian cartoonists, yet Matsumoto goes a long way in laying claim to the style. Like Noby Noby Boy, I start getting really excited when I think about these books. The plot has a set-up similar to Kill Bill, No. 5 is a member of a numbered crew of world-class assasins who has broken rank and is now tasked with picking of his former colleagues one by one. Brian Chippendale has an excellent write up here (as well as covering Matsumoto’s other books) so please, do yourself a favor. Also, there’s an amazing interview with Taiyo posted on Chris Butcher’s blog, another treat that’s worth a read. So besides great enjoyment, what do I get out of this kind of stuff. I think what I try to take away the most is the sense of calm silliness, both in subject matter and drawing. I’ll talk more about trying to develop my cartoony images in a later installment, but a good deal of what drives me toward simple graphic forms comes from work like this. I also learn a lot from the design and colors of this stuff. It can be childish without being overly faux-naive. As cutesy as some of this stuff can get, it doesn’t feel naive or all bright happy shiny optimistic. It’s a delicate balance that I’m trying to match. I’ll wrap it up with an anecdote. One night I had this dream where I found this comics shop I’d never been to before. It was laid out kind of like an old CD shop from the 90s, and towards the back was a whole rack of these amazing mini comics. I’ve kind of been trying to find something that I saw in my dream since then, but as I remember, they all had this kind of Japanese aesthetic that I’ve been talking about. The one that sticks out the most in my memory was one with a minimal cover design, beautiful simple line work on pink paper. Thanks and I’ll talk to you guys again soon!